It is not new that Portugal is Fado, but Lisbon is its cradle and therefore there is no better place to listen to it. Since I was a child, I remember this image: going up Rua do Carmo to hear some Fado playing. Some songs I recognized automatically and others we did not know but automatically began murmur along. After moving to Lisbon I realized that it was a real privilege to walk up this street and if we wanted, at no cost, listen to Fado and get to know some of its history. 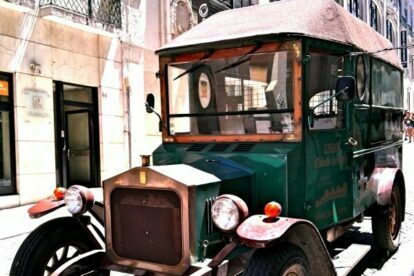 The car of Mr. António Cardoso, known as Fleur de Lys, is parked every day in front of the number 63 of Rua do Carmo, where, before the fire that decimated the warehouses of Chiado in 1988, the record store Cardoso (so called Distoqueca Cardoso) was located. Now you can hear Fado all day long without interruptions – except on Sundays. The highlight of this spot – in addition to being free and that Mr. António Cardoso loves telling stories about Fado – is the fact that we can also buy the records of our favourite Fados. And after hearing some Fado you can always climb up the Rua Garret and eat one of the wonderful cakes of the pastry Alcôa (check out my article “Alcôa – you will not be able to eat just one”) that I have already told you about.